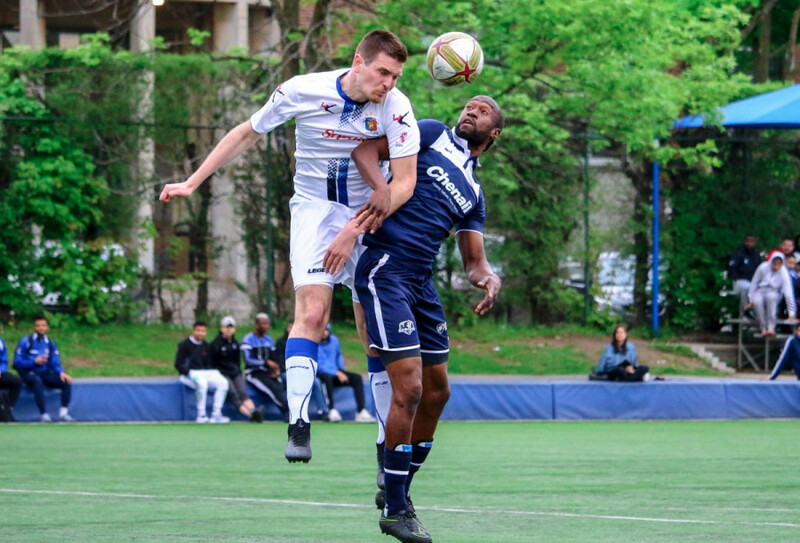 It was a tough battle for Luc Brutus and the Club de soccer Mont Royal Griffons, but an early first half goal and penalty save by Gabard Fenelon helped them leave with all three points on Saturday night against FC Gatineau. Wary of Gatineau’s Stefan Karajovanovic—who leads the Première ligue de soccer du Québec with eight goals in eight games—Brutus looked to nullify the 19 year old’s supply by breaking down their free flowing midfield. “They put a lot of pressure on us. They were coming at us left, right and center every time,” said Karajovanovic. The beginning of the PLSQ season saw the Griffons endure some difficulty finding a consistent string of performances. But since their loss to Association de soccer de Blainville, CS MRO’s latest 2-0 victory over Gatineau sees them extend their unbeaten streak to four games. If there’s any indication that the Griffons may have finally hit their stride, their first goal against Gatineau is exhibit A. Built from their own defensive zone after defender Louis-Philippe Campagna won a tackle, the Griffons were able to quickly move forward and circulate the ball towards midfield. A pass eventually found its way to midfielder Felipe Costa De Souza, who’s cross from the centre of the pitch found forward Mouad Ouzane who finished off the counter attack. Gatineau’s loss put them four points off of Griffons with an even four wins and four losses. The Griffons broke down Gatineau’s midfielders in the second half, leaving Karajovanovic isolated up top. The young forward had the chance to level the scoring toward the end of the match, but would be denied by Fenelon. Just two weeks ago, Fenelon produced a nightmare for himself and the Griffons after gifting a goal to nine-man Club de Soccer Longueuil to tie the game. After being rotated for Nizar Houhou against CS Fabrose in Laval last week, Fenelon returned in between the posts for Griffons. While the Griffons were up 1-0, a late penalty call made it seem as though their curse of late goals would continue. With Karajovanovic stepping up, Fenelon would deny the forward his ninth goal of the season. The penalty save allowed the Griffons to break forward on the counter once again, with substitute Mikael Lanzafame doubling the lead. “[The penalty save] felt good for the moral, especially after the game against Longueuil […] I couldn’t really let that take over me,” said Fenelon. Brutus was quick to praise Fenelon’s comeback, saying that he knew he would come in big for the Griffons when they needed him. “He knows the mistake that was done against Longueuil and we know he’s a very good keeper and a very good competitor,” said Brutus. Eight games into the PLSQ season, and still a ways to go, the Griffons’ recent run of form has already shaped what could be a close title race. Sitting just two points off of Blainville, Brutus said the Griffons are “aiming for first place” as they look to dethrone the defending champions. “We’re not going backward, we’re going forward. There’s one slot to go up and we’re gonna go for it,” Brutus said. While the Griffons have Gatineau, CS Saint-Hubert and CS Longueuil creeping up behind them, Fenelon said that the rest of the season will be harder. “On the field it’s [on the] players to know when to put it in practice in order to advance to the [Canadian Championship] and that still leaves us with a pretty difficult challenge,” said Fenelon. The Griffons will be back in action as they pay visit to St-Hubert before their next home game against Dynamo de Québec on July 15.